Archaeologists say a beautiful, monumental Maya carving, hidden inside a pyramid in Guatemala, shows how one 6th-century superpower asserted its influence over its rival. The stucco frieze was discovered last month at the Holmul archaeological dig in Guatemala's northeastern Peten region. 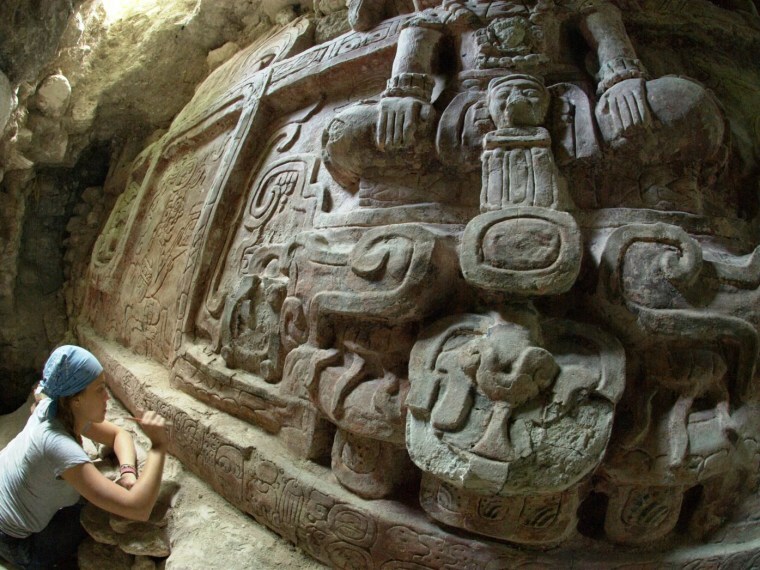 The carving and its accompanying inscriptions suggest that the region's rulers weren't just squabbling warlords, said Francisco Estrada-Belli, director of the Holmul Archaeological Project. Instead, those rulers were enmeshed in a bigger political clash between the kings of Tikal and the rulers of Kaanul, also known as the Snake Kingdom. "It's all a grand scheme of building a Maya empire," Estrada-Belli said. "Sometimes the Kaanul kings were on top. Sometimes Tikal was on top. But there was nothing chaotic about it." Estrada-Belli and his colleagues uncovered the frieze while they were excavating a 65-foot-high (20-meter-high) pyramid that was built over it in the 8th century. Estrada-Belli specializes in an earlier period in Maya history, and he was hoping to run across Preclassic Maya artifacts dating back to the year 250 or earlier. Instead, the archaeologists came upon the top of a Classic Maya building, decorated with a carving measuring roughly 26 feet (8 meters) wide and 6 feet (2 meters) high. The carving shows three human figures wearing elaborate bird headdresses and jade jewels, seated cross-legged over the head of a mountain spirit. Two feathered serpents emerge from the mountain spirit beneath the central character, framing two gods who hold signs reading "First Tamale." The bottom of the frieze is adorned with a band of about 30 glyphs, declaring that the edifice was commissioned by the ruler of Naranjo, a powerful kingdom south of Holmul. The inscription describes the ruler, known as Ajwosaj Chan K'inich, as a "vassal of the Kaanul king" — that is, the Snake Lord. "I was very excited when I saw that snake head on the glyph," Estrada-Belli told NBC News. "This fills a nice void in terms of the line of alliances to the east of Tikal, against Tikal. ... Even though this is a small site, we're feeling the influence of a greater power, which is the Kaanul kingdom." Alex Tokovinine, a Harvard specialist in Maya writing who deciphered the inscription, said the text indicates that the building and its frieze were erected sometime around the year 590 — not long after Tikal suffered a major defeat in the year 562. For almost two centuries after that, the Kaanul kingdom's Snake Lords and their allies were dominant in the Maya lowlands. The inscription suggests that Ajwosaj came in from Naranjo on behalf of the Snake Lords, to re-establish the local political and religious order after Holmul passed from Tikal to Kaanul control. The carvings may represent the deified kings of a former age, as dictated by Ajwosaj. "He's doing some kind of reorganization, not only for this site, but the region surrounding the site," Tokovinine told NBC News. "It shows the complexity of the Classic Maya political and religious world." During roughly the same time frame, the Snake Lords were also expanding their influence in a region farther to the west, known as El Peru-Waka. That side of the power struggle with Tikal has been documented by a different team of archaeologists. Estrada-Belli said the newly discovered frieze at Holmul provides evidence of an "eastern front" in the Tikal-vs.-Snake superpower struggle. This year’s investigation was endorsed by Guatemala’s Ministry of Culture, with funding from Guatemala’s PACUNAM foundation and the U.S.-based Alphawood Foundation, as well as support from Boston University, the National Geographic Society/Waitt Grants Program and private donors. There are many more mysteries yet to be uncovered: During their previous excavations at the Holmul site, Estrada-Belli and his colleagues came across the undisturbed tomb of a high-status male accompanied by 28 decorated ceramic vessels and a wooden funerary mask. The man's incisors and canine teeth had been drilled and filled with jade beads. Estrada-Belli suspects that the man may have been a member of Holmul's ruling class, but further study will be required to fill out the story. "Lo and behold, we have this wonderful frieze full of characters," Estrada-Belli said. "One of them might be the guy who's buried in this building. We just don't know." The archaeologists haven't yet gotten a chance to see what's inside the building they found inside the larger pyramid. And due to the onset of the rainy season in Guatemala, they'll have to wait until next spring to resume work. Even though the site is being monitored to guard against looting, Estrada-Belli still worries about the mysterious structure. "I feel like I'm not going to be able to sleep until I go back and see that nothing has happened to it," Estrada-Belli said. Francisco Estrada-Belli is an Italian-Guatemalan archaeologist affiliated with Boston University and the American Museum of Natural History, who is currently teaching at Tulane University. He is a National Geographic explorer, having received 13 research grants from the National Geographic Society. Alan Boyle is NBCNews.com's science editor. Connect with the Cosmic Log community by "liking" the NBC News Science Facebook page, following @b0yle on Twitter and adding +Alan Boyle to your Google+ circles. To keep up with NBCNews.com's stories about science and space, sign up for the Tech & Science newsletter, delivered to your email in-box every weekday. You can also check out "The Case for Pluto," my book about the controversial dwarf planet and the search for new worlds.